Goodreads: For thirty-eight years, Bartholomew Neil has lived with his mother. When she gets sick and dies, he has no idea how to be on his own. His redheaded grief counselor, Wendy, says he needs to find his flock and leave the nest. But how does a man whose whole life has been grounded in his mom, Saturday mass, and the library learn how to fly? Kritters Thoughts: Quirky. This book was full of some quirky characters with extreme eccentricities. Bartholomew the main character was quite an older gentleman to have lived in his mother's home entire life and I kept forgetting his true age! An alcoholic priest who leaves the church, a fellow therapy patient who likes the word F$%# a lot! and a girl who he has been pining over for awhile - what a combination! 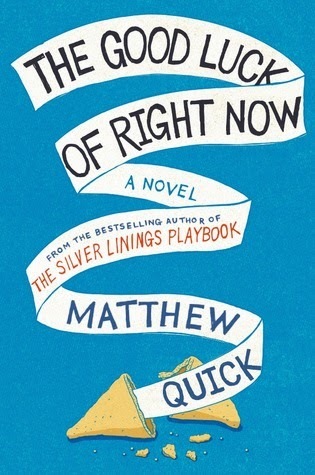 As this was my first Matthew Quick book, I wasn't sure about his style, but knew of him through his previous book being made into quite the hit movie. This book was told from Bartholomew's perspective through letters to Richard Gere - interesting, but it fit the character completely. I am not one to enjoy profanity, so I had a hard time reading the parts that included the character Max, but there again, I thought it fit the character so I agree with the author putting it in. I am not sure about this author, I think I would like to give him another try, but it may have been a little too much quirky for me! Quirky is definitely a good word for this book!